Ye-haw! They’re the rootinest tootinest inflatable event around. Yup. You guessed it. I’m talking about mechanical bulls. They buck. They spin. They throw you around. So why is it in a world that seems increasingly determined to wrap us and our children in bubble wrap, do we still want to see who among us can make it to eight seconds on a bucking bull? It doesn’t seem to matter what age we are. Young and old, everyone wants to ride the bull. Professional bull riding can trace its roots all the way back to 16th Century Mexico. It quickly immigrated to Texas and then America. However, it didn’t become a professional sport until the 1930’s when The Rodeo Cowboy Association was formed. Today, you can find professional bull riding in countries like Canada, several Latin countries, and even New Zealand and Australia. Naturally, after watching your average 180 lbs. man get tossed around like a rag doll from atop a 2,000lbs. beast and nearly trampled before a pair of rodeo clowns come to his rescue, you’re bound to want to try it yourself. However, right after you catch a glimpse of yourself in those leather cowboy chaps, you might just reconsider and rent a mechanical bull instead. Mechanical bulls have been around for quite some. In fact, one of the earliest recorded commercial mechanical bull rides was that of the “Ride ‘Em Cowboy” located at New Jersey’s Bertrand Island Amusement Park in the 1930’s. Though it would be a movie from 1980 that would catapult the mechanical bull to it’s current popularity. Before John Travolta was communing with Xenu he played Bud, a small town cowboy with big city dreams, in James Bridge’s Urban Cowboy. In this movie, Travolta’s character rides an El Toro brand rodeo mechanical bull to victory and a $5,000 purse. The El Toro was built to train professional bull riders and had two speeds: on and off. 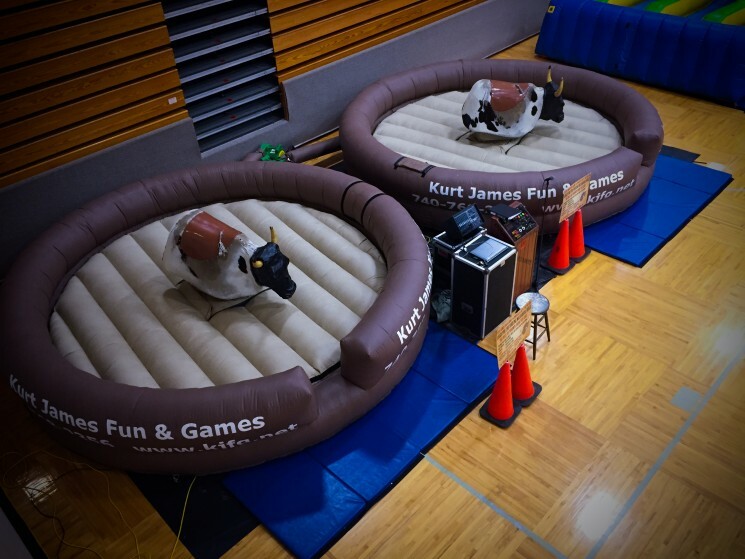 Today’s mechanical bulls, like those in the above picture are manufactured with variable speeds and bucking/spinning programs to accommodate novice bull riders. Also, as you can see in the picture above, most if not all, modern mechanical bulls come with inflated airbags to cushion the inevitable fall. What you can’t see is that, unlike their cousin the El Toro, these bulls are not built to simulate the texture and feel of a real rodeo bull. Instead, their saddle is a smooth plastic surface that simple doesn’t allow the rider to hold on too tightly which can cause trauma. They also come with soft break-away horns and cushioned heads. That’s not to say that there’s no risk when riding these machines, but the risk has been greatly mitigated. All riders should do so with care. Now that we know their history, why do we love them? As with many things, I suppose that it comes down to the individual. Some people ride them to prove something to themselves while others are looking for a quick fix of accomplishment. Many will ride first because of the novelty, but the second, third, and fourth times are just because they are plain fun. The truth is, that no matter what age we are, most of us still love to pretend. It that weren’t the case, video games, movies, and The Walking Dead wouldn’t exist. Each year billions of dollars are spent to give people a few brief moments of escape into fantasy. The mechanical bulls not only provide fantasy, but it is interactive. The rider is experiencing something real at the same time that he is fully immersed in fiction. I believe that it is this dichotomy of experience, a complete fiction accompanied with sites, smells, textures, and sound, that we seek and love. It’s funny. 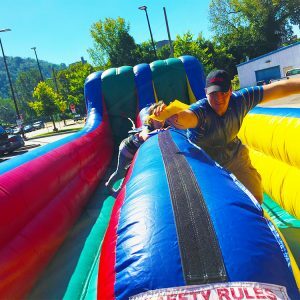 I travel all over Ohio, West Virginia, and Pennsylvania and no matter where I go it is almost always a challenge to get that first rider or, in the case of our Dueling Mechanical Bulls, riders up on the bulls. The venue doesn’t matter either: fairs, festivals, bars, weddings, and parties, it’s all the same. Invariably I find myself looking at the person who rented them for the night and hoping that he, or she, isn’t too concerned because if there’s one thing that I know it’s that once we get that first couple up, the rides never stop. It always bugs me though, when I can tell that a person actually wants to ride the rodeo bull but won’t let themselves; and it’s not out of fear of physical injury. I’ve been doing this long enough to know that look. No, it’s fear of injured pride. The thing is that I’ve never seen anyone exit the bull arena whose buddies didn’t slap him on the back and congratulate him on just trying it, even if he stunk and fell off the bull after only a couple of seconds. For those who can set aside their pride and allow themselves to let go of a little control for a few short moments, riding a rodeo bull will give them a smile that lasts for days. Why do you believe that we like these things so much? Let us know in the comments below. I do not think I’ve read anything like this before. So great to find someone with some original thoughts on this topic. great one for starting this up. This site is something that’s needed on the web, somebody witha bit of creativity. I’ve always been someone that has always wanted to ride a mechanical bull, but have honestly been afraid of falling off. That being said, I’m super excited to see one in inflatable form. Now I feel like I could actually give it a try. Guess I now need to find one of these in my area! Awesome, thanks for sharing!